If you have a high-traffic website and you are looking to monetize your website with Best CPM ads Network? Today we are going to talk about the Best CPM Ad Networks 2019 For Bloggers and Advertisers, but right before we do that, I think is good for us to go ahead and take care of some important concepts in order to make sure that we fully understand what’s being said here. Here, I have a list of the best CPM ad networks that a publisher like you can join & start earning money through these High CPM ads network. CPM advertisements are the best way to make money with your blog. CPM also was known as Cost per thousand is used to denoting the cost of 1,000 advertisement impressions made on one webpage. If you are a newbie, then CPM is one of the best ways to give you a head-start as you are paid even if visitors do not click on the ads. Here, you are paid for impressions and NOT for CLICKS. Mostly, the CPM Ads Network pay you ranging from $1 to $10 per 1000 impressions. This payment is dependent on many other factors which you have to choose before you select CPM Network. Propeller Ads is a very popular and best CPM ad networks among bloggers and publishers. you can try propeller this year 2019. Propellerads offers all types of ads for all type screens, which makes it a most popular choice for various webmasters, it include multiple payment options make PropellerAds an ideal choice for bloggers. The minimum payout is $100. you can receive payments through Payoneer, Paypal and wire transfer. Propeller Ads offer real-time reporting (which is something we all love). Media.net is the best choice of both publishers and advertisers. It is based on contextual Advertising Network which runs by the Yahoo! and Bing, high quality and also high paying ads for publishers. Media.net is one of the best high CPM ad Network and best alternatives to Google Adsense. Media.net is mainly targeted to small and large Bloggers who produce quality content. Content must be in English and unique, original. You get to enjoy the support from a Personal Account Manager. Payment methods like PayPal or Wire Transfer are available. Media.net is compatible with Google AdSense. Adbuff is one of the most popular CPM ad Network due to its real-time bidding platform. this is the best CPM ad networks for small publishers. Adbuff also offers CPC & CPM both ads formate, you can use the combination of CPM + CPC to increase your revenue further. You need to have a quality site with 2000 unique visitors per day. Minimum payout is $100 & the payment modes include PayPal, Payoneer, Bitcoin, and wire transfer. They provide a mobile app to monitoring and check how much revenue you are generating. Conversant is the most popular name in the advertising industry. 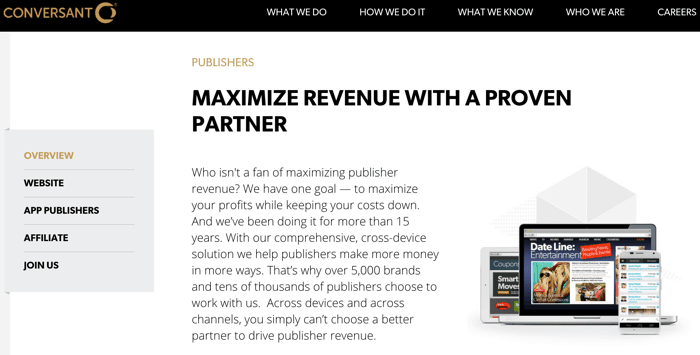 Conversant media offer to monetization their websites, and also mobile apps. they are one of the more reliable CPM-based ad networks. Ads are compatible with Google Adsense. Minimum 3,000 impressions per month for your site to be accepted. Conversant Minimum Payout is $25. Different kinds of ads size are available like 120×600, 728×90, 300×250, 160×600, 468×60, 180×150, InVue, pop-unders, half-page, flexible banner, interstitials, in-text links. Formerly known as Tribal Fusion, Exponential is one of the oldest CPM ad networks. Exponential ad network offers high impact ads such as Rising Star ad formats and pre-roll ads with 55% of revenue going to their publishers. Minimum 5000 unique daily visitor also 500,000 views are required. Minimum payout is $50, and payment policy is Net45. This was the list of our Best CPM ad networks for the year 2019. For any further queries, post in the comments section below. Enjoy blogging and make money.